Anyone who fancies the life of a long distance trucker might be tempted to check out this title or perhaps one of the games in the extensive series of 18 Wheels of Steel series. You're probably best off with the latter option if you do desperately want to experience the lonely lifestyle as this one is just too tedious and dull for its own good. As you might expect from the title, this one throws you into the bouncy cockpit of a mighty hauling machine and charges you with delivering a wide range of goods around picturesque Europe. 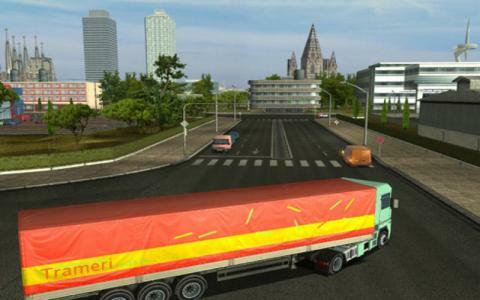 The main focus here is the career mode which starts you out as a lowly driver for a delivery company and sees you moving your way up to the glamorous assignments by successfully completing runs quickly and efficiently. As you earn more money, you can purchase new trucks and upgrades while you'll also get to visit more exotic locations and live the adventurous life. Each truck is highly detailed and authentic, with all the expected lights, wipers and other bits and bobs to play around with. Big Rig Europe really is best suited for armchair trucking fans who just love the idea of playing with imaginary steel monsters. It is admittedly detailed and feels quite realistic but as with others games of this sort, that's also the game's biggest problem. Anyone looking for real racing thrills is just going to find this dull and uninteresting, as you've got to stick to the speed limit and play nicely, instead of haring around like a mad thing. If this does sound like fun to you, then by all means give this a go, but otherwise, avoid.